All 18 Sur La Table promo codes have been verified and tested today! 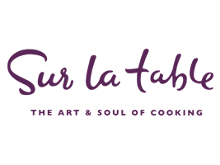 Some Sur La Table promo code offers can be redeemed not just for merchandise, but for cooking classes at a Sur La Table location near you. Just go to Sur La Table, select “CLASSES” in the navigation menu, and enter your location. Next, simply enter your coupon at the checkout screen, and enjoy your discounted cooking class. The savings don’t end with Sur La Table coupons. You can get great deals from Sur La Table every day by shopping its selection of clearance and sale items. To get started, just head to the Sur La Table website, and click “SALE” or “CLEARANCE” in the upper navigation bar. You’ll be able to save anywhere from 10-65% off on cookware, appliances, and accessories from top brands like All-Clad, Le Creuset and more. If you’re a chef, cook, culinary student, or any kind of culinary professional, you may be eligible for a 10% discount on all full-priced items at Sur La Table. To sign up, just visit a location near you to present your professional credentials, or proof that you are enrolled in a culinary program. During seasonal sales, many items at Sur La Table are eligible for special offers. One example offer is a free $25 gift card to Sur La Table when you spend $250 on Wusthof products. To see if your products have special offers, just look for the red text underneath the item’s listing that reads “+ Special Offer.” Click on the item, and you’ll be able to get more details about the special offer, and how to qualify. The list could go on. If you plan to register at Sur La Table, click the “REGISTRY” and “Gifts from us” link to see all of the most recent gift registry offers and promotions, and to see what you can get when you register. Sur La Table is one of the best online stores for purchasing home kitchen goods. From accessories like dish towels and racks, to top-rated cookware from major brands like Lodge, home cooks will find everything they need. Found a great Sur La Table coupon code you’d like to use? Not sure where to begin? Here’s a quick, step-by-step guide on how to redeem it, and save big on supplies for your home kitchen. It’s easy to save with a Sur La Table coupon from CNN Coupons. So find a valid code now, and get everything you need – for less. Want to save big on cutlery, cooking appliances, cookware and more? If you join the Sur La Table email list, you can get a Sur La Table coupon for 15% off of your entire first order, and free shipping. When you visit the Sur La Table website or the first time, you’ll get a pop-up offer with this deal. Just enter your email to redeem it, and have the Sur La Table coupon code sent directly to your account. If you didn’t see this offer, don’t worry. You can still sign up and get this Sur La Table promo code. Just scroll down to the bottom of the website, and enter your email address and ZIP code in the provided text fields, and you’re good to go. Your coupon will arrive momentarily. If you need to return an item to Sur La Table, doing so is easy. You can either return your item through the mail, or head to the nearest Sur La Table store near you. You can get a full refund on your item if you return it within 60 days with a receipt. Returns made without proof of purchase will not be accepted. If you choose to mail your return rather than take it to a store, simply fill out the included return form, and use the pre-addressed Return Label to return it. Shipping is not prepaid, so you will be responsible for covering the cost of shipping the item. Your refund will be issued within 10 business days of your item being received by Sur La Table.